The Power Of A Rotary With The Safety Of A Dual Action Polisher. 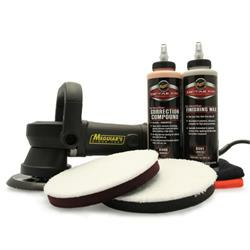 The new DA Microfibre Correction System has been engineered specifically for factory applied paint and allows effective paint correction without the holograms usually left behind when using a rotary polisher. Comprising of two liquids and two microfibre pads, this new system really is revolutionary. The microfibre pads have foam backings of different densities to give "cutting" or "finishing" qualities. The liquids were designed after the pads to work directly in conjunction with them. 2 x MF1 microfibres FREE ! !